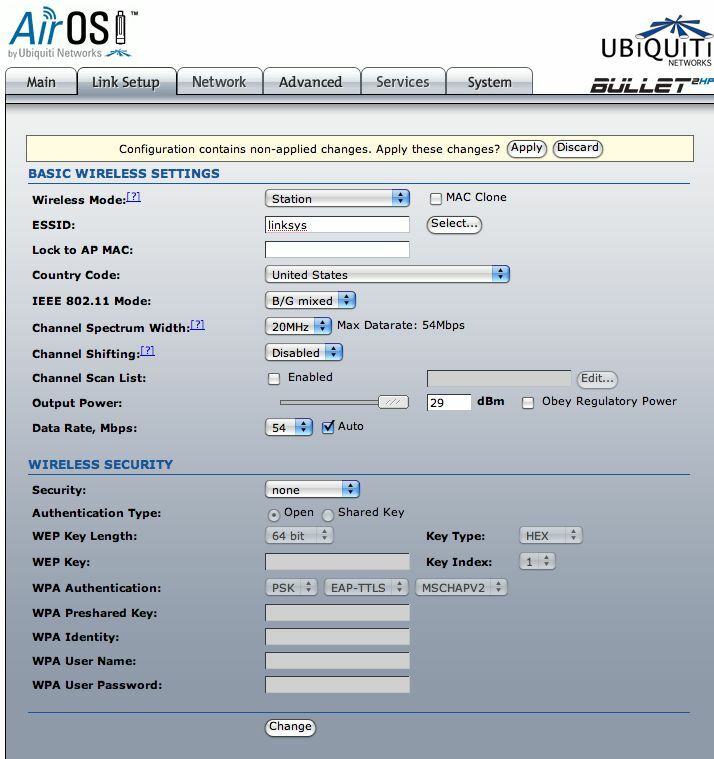 For the last few years, we have heard a lot of chatter about the newer Ubiquiti Bullet that cruisers and boaters have been raving about. From Mexico to the Bahamas to New England, everyone has been posting excellent WiFi access with the Bullet so we just had to see what all the fuss was about. It was a difficult decision because our Engenius adapter was still providing us with all of the access we needed and one of my top rules is, "if it ain't broke, don't fix it." But curiosity finally got the best of me and we purchased the Bullet M2 HP. A big plus was that the antenna for our original set up would work on the Bullet, so this part did not have to be replaced. Any money saved is always a good thing. The Bullet screws directly on to the antenna so no cable connection is required. The mounting components that we changed early on and have been using for years works great with the new hardware. The Bullet fit perfectly in the PVC pipe mounting we have been using. This mount helps to overcome one of the problems with the Bullet - having it outside in the weather. It provides a waterproof housing that will keep moisture intrusion out of the cable. Unlike the Engenius adapter, the Bullet is attached via a Cat5 cable instead of an active USB. In this photo, we test fitted the Bullet and antenna to the cap to be sure the hole size did not have to be changed. Once it was clear that everything would fit, a bit of sealant around the hole where the antenna passes through, and around the cap and bottom, made everything perfectly water tight. 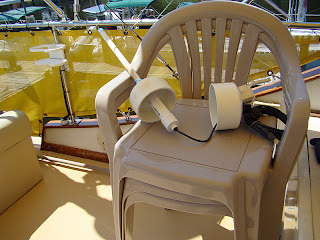 With the Cat5 cable, there is no restriction as to the length, so we carefully measured how much was needed to run from the mount, through the boat and to the computer. The computer is in our forward cabin where we have set up our "office." We do have another computer at the helm station and we want to be able to access that with WiFi also. A little more about that later. The mounting looks clean and unobtrusive. In this location, it has done well for us, but on other boats, another location might work better. 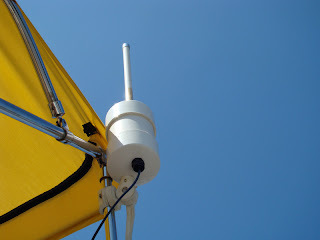 We have found that the higher up it is mounted, the better reception for the access stations. I also recommend that outdoor Cat5 cable be used or at least cover the cable to provide additional UV protection. Our cable runs down the bimini frame, into a vent near the bottom of the outside of the flybridge, down a wire run to the lower helm station and then into the forward cabin, starboard side. The hardware installation is not quite done yet. 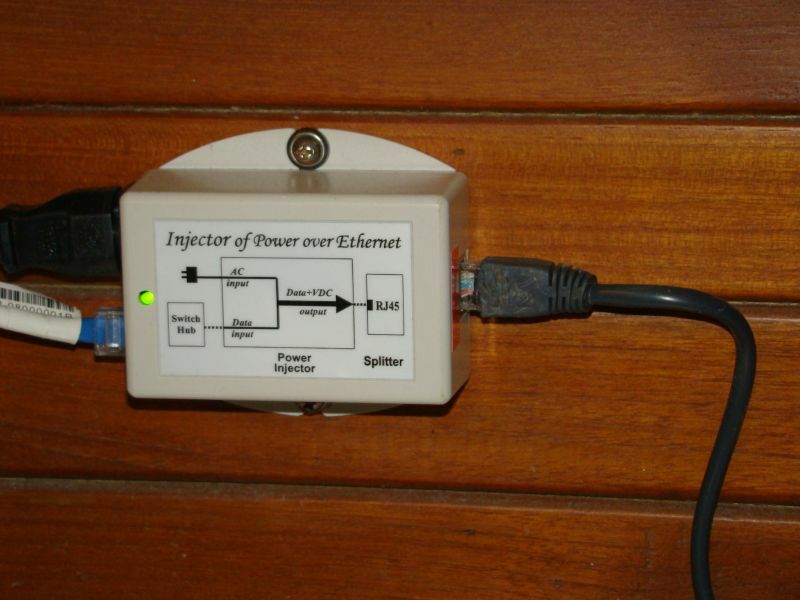 Unlike the Engenius, the Bullet gets its power through a POE (power over ethernet) device. Be sure it is a 12-volt device since they can be purchased in various voltages. There are many sources for a 12-volt POE, including Pasadena Networks where we purchased our Bullet. 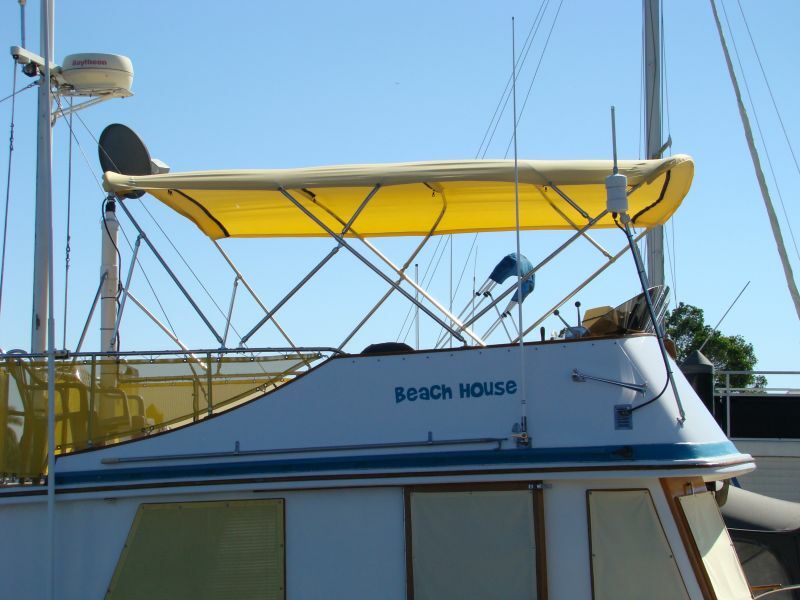 The POE can be either 12-volt powered and wired directly to the boat's DC system or 120-volt powered, which means it will run off of the shore power, generator or inverter. The installation is simple. The incoming Cat5 goes into the input side and another Ethernet cable comes from the outlet to the computer, or as we did, a separate router. Since we have multiple computers, we want to be able to access the WiFi on either computer and not have to plug and unplug them. We also want to be able to use the computers anywhere on the boat and not be restricted to the forward cabin. We chose the Cradlepoint Router, once again because of positive feedback from users. It isn't one of the least expensive routers, but we have found it to be of excellent quality. Our choice was the MBR 900 and it turned out to be a good choice for us (this router has been replaced with another model). Now here's where it gets tricky. Our Engenius was pretty much plug and play. 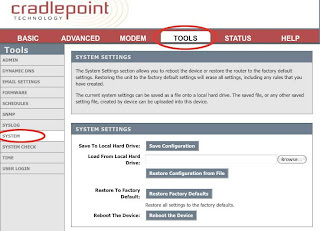 If you are at all intimidated by setting up computer hardware, you might consider a couple of choices. These systems can be purchased, for a great deal more money, already put together and set up to run when you get them. Or you can use a system like our Engenius that is very simple to set up. There is a fair amount of extra effort to get the Bullet set up and running and even more to to add the router to the system. If you still want to go for it, the next step is to set up the Bullet. An excellent how to can be found here and here. Although the second link is for a Nanostation, it works for the Bullet. The Cat5 cable needs to be connected from the Bullet to the POE and then directly to the ethernet connection on your computer. The POE must have power, either from your DC or AC system, in order to do any set up. Once you have followed all of the instructions for the Bullet set up and confirmed that it is working, the Router needs to be set up to work with the Bullet. 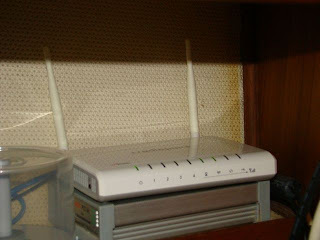 Rather than make this a very, very long posting, I will refer you to a good set up how to for the CradlePoint router. If you had no problem setting up the Bullet, you won't have a problem setting up the router. These instructions are specifically for the CradlePoint, so if you are using another brand, you are on your own. Once the router is set up, the Cat5 cable from the POE is connected to the input for the router. 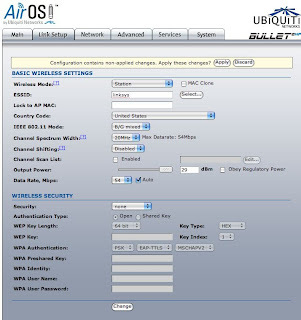 You computer is then set up to connect via WiFi directly from your router. Be sure and enable your security for the router and choose a very difficult password so no one else can log in to your network. And that's it. Hopefully all went well and you are blogging like mad. And now for our review. We've been using this system for about two years now. We find it to be an improvement over the Engenius system, BUT not a major improvement. If we had to stay with our original set up, I wouldn't have the slightest problem with that. We do seem to pick up a few more access points ON OCCASION than we did with the previous system. But most of them are secure access points so we don't really have more connections. We have received signals from access points at two miles away or more with the Engenius and don't seem to do better with the Bullet. Perhaps once we are cruising in locations where we have not been before and where there are weaker signals to work with, the improvements might show up better. In the end, time will tell. For now it works fine and we have the old system as a back up should we have a failure. I feel very comfortable and confident with both systems. Whether you should upgrade is a decision you will have to make. If your current system is not living up to your expectations, then by all means upgrade. If you are starting from scratch, I highly recommend that you go with the Bullet. Good luck and stay safe. And be sure to read our post on securing your WiFi connections. 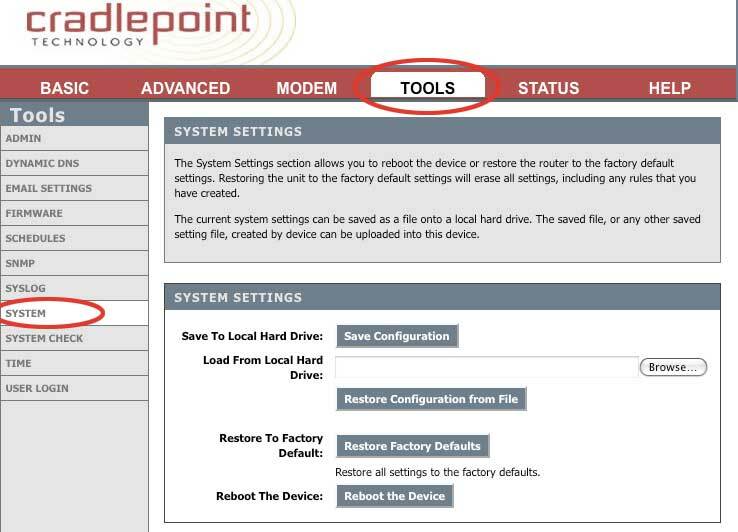 how do you power your Cradlepoint Router? 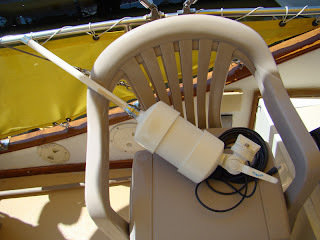 With the wireless LAN inside your boat, do you designate another channel so it doesn't interfer with the incoming WiFi? Also, I wonder if you can "daisy chain" a group of boats moored together. There is no need to do anything with the "channels" however you do need to be sure the router and the Bullet is not using the same IP address. If you give other boats around you your password to log into your router and make sure the router is broadcasting it's SSID, a setting in the router, others can log in. Love this site keeps me focused on retirement. Thanks Greg. If that's a question, the DC to DC converter takes the 12 volts from the boat and converts it to what is needed to run a device. Typically they are used for laptops to covert the boata 12 volts DC to the 19 volts DC needed to run it. Chuck. How is the Bullet supported in the PVC tube? Do you have any problems with the Bullet working loose. 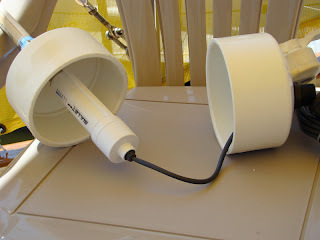 I have a sailboat and it seems like the Bullet would "wiggle" and create a leak path if only hanging from the antenna silicone into the top cap. The Bullet is very secure and there is a "nut" on the threaded end of the antenna that holds everything securely, The silicone is only a sealer. Our unit has been up for years without any issues. Hope this helps.